Turner Classic Movies and Universal Studios Home Entertainment present the newly remastered Audie Murphy Westerns Collection. The most decorated American soldier of World War II, Audie Murphy parlayed his heroic exploits on the battlefield into a successful film career in Hollywood. His handsome, boyish appearance and shy, soft-spoken manner made him an appealing and uniquely different kind of action hero which provided an intriguing contrast to his athletic skill and quiet intensity. 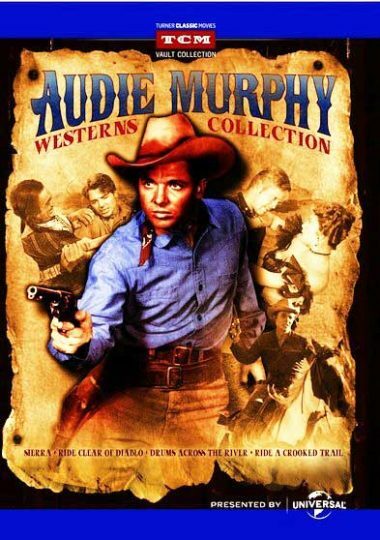 4 – DVD Set of action-packed westerns. COLOR. SIERRA (1950) Ring Hassard and his father Jeff live in a hidden valley in the mountains where they capture and tame wild horses. When Ring comes to the rescue of Riley Martin, a woman lawyer (Wanda Hendrix) who has lost her way on the trail, it leads to a romance. There is trouble from a gang of horse thieves and murderers. Wanda Hendrix, who was married to Audie Murphy at the time, makes a fetching heroine and the film is notable for an early appearance by Tony Curtis in a villainous role and a colorful performance by Burl Ives. DRUMS ACROSS THE RIVER (1954) Driven to desperation by hard times, Frank Walker (Lyle Bettger) and a party of miners decide to dig for gold in Ute Indian country despite a peace treaty that forbids trespassing on their land. Joining the group in spite of his fathers warning is Gary Brannon (Audie Murphy), who has no qualms about breaking the treaty since his mother was killed by the tribe. The miners actions soon incur the wrath of the Ute and Gary finds himself caught in the middle of a deadly situation that threatens to erupt into a bloody race war. RIDE CLEAR OF DIABLO (1954) Clay OMara (Audie Murphy) vows to bring justice when his father and brother are murdered by cattle rustlers. RIDE A CROOKED TRAIL (1958) directed by Jessie Hibbs. Murphy stars as a bank robber who asssumes the identity of a famed U.S. marshal in order to avoid capture.